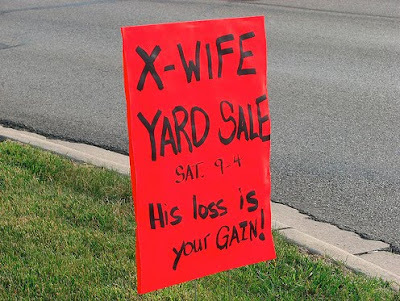 Upon first glance, someone might think this was some dude trying to sell off his ex-wife. I’m not the only one who thought that, right? Then there’s the possibility that maybe the ex-wife was selling off all her husband’s belongings as an act of revenge. Either way, the fact that this simple sign has made me contemplate the contents being sold is a total win. This woman might be onto something. Public embarrassment may actually be the ultimate form of revenge. Forget the ever popular stalking or resorting to violence. Just publically state the facts! 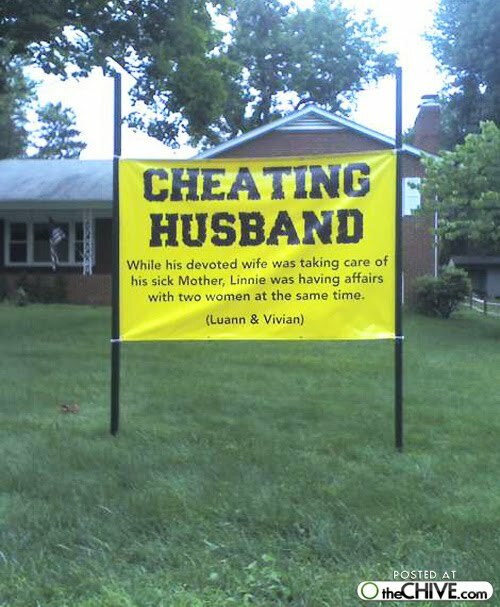 Big props to the “devoted wife,” for actually dishing out money to create this sign. The impact of the sign is maximized by the slick design. If the sign was just slapped together with markers and poster board, it wouldn’t be nearly as impressive. Who else thinks that if this person had a home on Halloween, they’d also leave a sign that says “Candy. Please take ONLY ONE!” Remember those houses? I hated those houses. 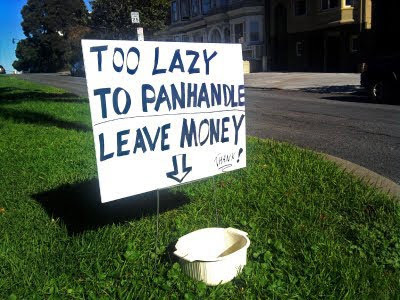 At least this person is honest that they’re too lazy to panhandle, which means they’re too lazy to work… hence the need to panhandle. It all came full circle. Wait. What? So many questions. So little time. What were the cows used for? 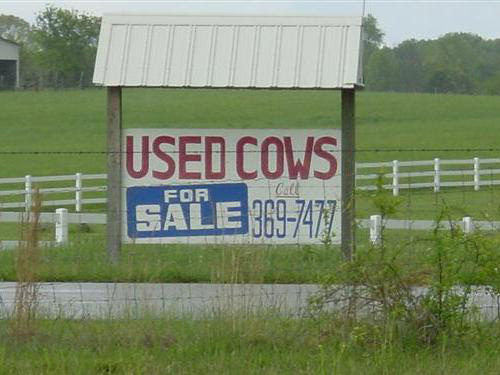 Are the cows in good condition? How much does a used cow go for these days? Is there an equivalent to the Kelly Blue Book value to determine the worth of a used cow? Alright, maybe not the“funniest” yard sign ever created, but it does pose a few questions. How many pirates live on land and advertise that they are there? 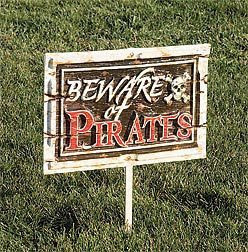 Are there pirates in suburbia? 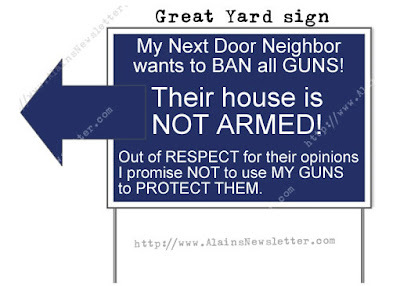 What will they do if someone steps on their front yard? Make them walk the plank into their in-ground 8 foot deep pool that is surrounded by exotic plants purchased from Home Depot? Ahhh, here we go. 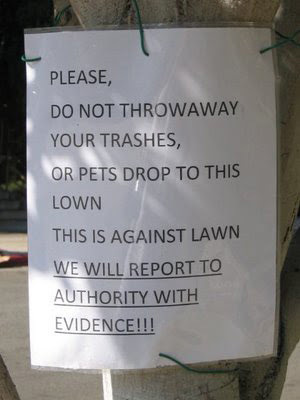 The “try and true” method of threatening those that dare to do anything to your precious lawn. Worst that can happen is that they’ll berate you with improper grammar… right? Besides, what are they really going to do? Carry dog poop to the police? Evidence! I can has it! Whoops. Not a yard sign, but a good one nonetheless. Upon seeing this picture, one may immediately started singing “Ironic,” by Alanis Morrisette. In defense of the sign, it seems to be doing its job. 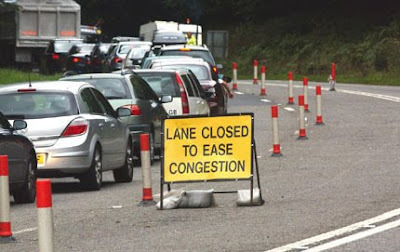 Look how empty that second lane is! Not congested at all! There’s always some truth in advertising. “It’s better to tell the truth,” they say. 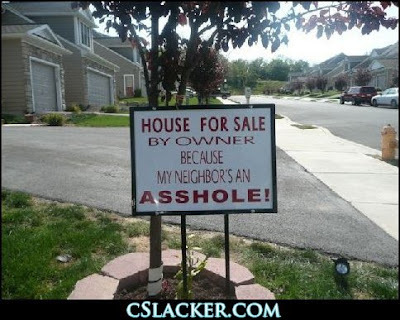 However, one has to wonder how many inquiries to purchase the house were actually put forth knowing that they’d potentially be living next door to an a&%hole.